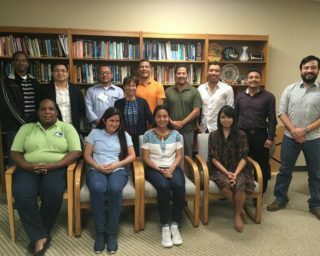 During the period 8 January through 2 February 2018, HRC hosted 12 meteorologists and hydrologists from Belize, Guatemala, Honduras, El Salvador, Nicaragua, and Costa Rica for operational training on the Central America Flash Flood Guidance (CAFFG) System. Known as Step 3 Training of the Flash Flood Hydrometeorologist Training Program for users of the HRC-developed Flash Flood Guidance system, the training covered a wide variety of topics related to flash flood forecasting and warning in their countries. Topics covered included the science background to flash flood occurrence and interpretation and use in operations of the products available from the CAFFG system. During the training, the representatives provided daily daily weather briefings and discussions for their countries – looking at both historical and current examples of flash floods and the conditions – both meteorological and hydrological – that lead to flash flood events. During this time, the representatives also are trained to use the Interactive Simulator Training Program. The simulation exercises form an important part of active learning techniques and effectively compliment the advanced operations training. The FFG system simulator utilizes real world scenarios in which a flash flood may or may not occur. This requires the user to make an assessment based on the knowledge they have available and assess their skill and understanding of the unique characteristics of flash floods. Upon successful completion of this Advanced Operations Training each representative earned an HRC Advanced Training Operations Certification.